A first CD release by Audio.nl, Hexen has a rich and adventurous background story. Motor is the alias of Moscow-based electronic musician Vadim Ugryumov. By the late nineties, he was already an experienced electronic producer and professional sound engineer, arranging tracks and making remixes for commercial pop artists and radiostations. He organized several club/dance projects, such as Techno Dance Club, and released solo material under different aliases: Navigator, Leonardo D.K.. Many of his tracks were heavily rotated on the legendary Station 106.8 FM (a radio station solely dedicated to dance and alternative electronic music), favored by DJs and an emerging Russian rave community. Ugryumov was also a member of Triplex collective, and co-produced remix on the opening theme from the widely popular Brigada TV series, which became an instant success across the entire nation, and one of the most popular ringtones for a season (back in the nineties, it was pretty much the only legal distribution channel in Russia, providing some tangible royalties for artists on a predominantly pirated CD/tapes market). Motor was a new alias, created for a deeper, subtler, experimental creations, and they become more and more important as Vadim Ugryumov grew tired of unpretentious and overly-simplistic aesthetics in mainstream club music. Hand-crafted over a prolonged period of time and showcasing the most refined compositions, Hexen was self-released on blank CD in a clear jewel case with MOTOR HEXEN sticker on the front, and no further details or liner credits. Eight irresistibly groovy, punchy, Colognesque minimal techno tracks were blended with a few abstract soundscape interludes, and shorter experimental compositions, similar to Basic Channel and Monolake productions. Hexen was distributed via indie record stores in Russia, and supported by Птюч, or Ptuch Magazine – a cult semi-counterculture publication (sort of a clash between Dazed and Confused and Mixmag), in print from 1994 to 2003, which had been covering an emerging rave scene and youth subcultures in Russia. A round yellow sticker, which can be seen on the Discogs submission, says 'Ptuch Magazine presenting,' and was added only for local Ptuch promotional efforts (that's why it is missing on most exported copies still available for sale from European and American collectors). Several copies of the self-released album made it to the West, thanks to a friend who was running a private mail-order distribution and had close contacts with European independent labels and publishers. By chance, Hexen ended up in the hands of Peter Duimelinks, head of V2_Archief label, as well as Michael Mayer and Kompakt crew, and they all were profoundly moved by this record. A clear CD without cover art – perhaps they even thought it was a demo, but such an impressive one! Dutch producers immediately contacted Motor via an attached fax number. The entire context of Audio.nl launch is unclear – whether Goem were literally inspired by Vadim's music to create a new label, or they already had some material lined up, and just decided to freshen things up a bit by launching a recently discovered new name first. 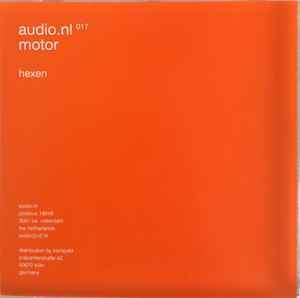 At any rate, soon after Audio.nl presented Motor's first 12" single, 1, 2, 3, with three tracks from Hexen. More releases followed, all in standardized orange sleeves with ultra-minimalistic solid colored labels – by Goem (including Aaarrghll....!! / Motormix 7" with remixes from Motor and Jos Smolders), Roel Meelkop as *slo-fi, Radboud Mens, Taylor Deupree, Auch (dance-oriented side project of Ekkehard Ehlers), Frank Bretschneider a.k.a. Komet, surprisingly Muslimgauze (with two expanded/reworked tracks from Azzazin 1996 album), Hanno Leichtmann's Static, and other well-established names. Audio.nl became an instant success, and more Hexen tracks had been released on sequentially numbered 4, 5, 6, 7 and 8, 9 records, until the label decided to re-issue the entire 'Hexen' as their first CD production in 2001. First thing that caught a listener's attention is a blatant, provocative simplicity of the bass line melodies on most tracks. Those exploitative, ear-worming, instantly catchy melodies made it almost physically impossible not to bang your head or, at the very least, tap your foot to Hexen hyper-exalted, explosive dancefloor bangers. The album is truly remarkable, though, for virtuoso, almost surgical precision in effects processing and sound manipulating. A sparse, booming, 'echo chamber' sound ambiance on this post-bleep techno journey is filled with intricate acoustic details: every micro-sampled hi hat, every click, every dry and lean synth arpeggio serves its purpose in a hardly noticeable and perfectly suspenseful track development. Numerous field recordings and trippy outros act as perfect interludes between longer tracks, and range from droney industrial noises, humming mechanisms, blissful ambient passages, and a public announcement in the airplane cabin to eerie sound collages. A fairly common technique of cross-fading BPM-driven tracks with rhythmless pieces is sometimes used in the unexpected way. Take, for instance, Track 5 ending, where a slowly emerging new rhythm, perceived as the next track theme, ended up being a blind lead. Instead, you're awash with a massive, hazy glitch ambient wave out of nowhere, which in turn leads to a surrealistic cut-up musique concrete meltdown on Track 7, with a cult Hexen: Beyond Heretic computer game heavily sampled, chopped, and screwed. The overall mood of the album changes inexplicably after this abstract sound art segment, gradually descending from hyped-up party vibes into more of a lone, melancholic afterhours listening session. There are still plenty uptempo and euphoria-inducing techno bangers, such as Track 10, and especially Track 14 – a monumental post-Detroit groovy dark techno, reminiscent of early Kenny Larkin, a few side-projects of Drexciya-mastermind James Stinson, and Juan Atkins in collaboration with Moritz von Oswald. One of the deepest and most fundamental tracks is followed by more 'Hexen: Beyond Heretic' samplecore shenanigans on Track 15, which is an even more suspenseful and paranoid experimental sound collage. A profound and solid 'alternative techno' album, Hexen stands just as firmly today as fifteen years ago, and worth re-visiting/discovering no less than any of the universally recognized late-90s / mid-2000s electronica classics. Ironically, by the time 'official' Hexen CD was finally released, it could've served at most as a retrospective work for Motor himself. Debutant of a successful new label, accompanied by most renowned experimental techno luminaries in Europe, who released an album praised by producers and DJs (and described by Michael Mayer as 'maybe the most wicked and euphoric record on Earth') – seemed like a perfect start for a fruitful and bright career. But even on the cutting edge of European minimal techno scene, a monotonous and fundamentally primitive 'four to the floor'-centrism became too obvious and predictable for Motor's restless mind. Inspired by a truly radical sound art of People Like Us, The Hafler Trio, Francisco López, TV Pow, Toy Bizarre, Tmrx and Quiet American's headphone tourism, Vadim Ugryumov launched top-40.org label and started exploring a far less populated and conventional territories of radio/found sound collages, unprocessed field recordings, extremely quiet lowercase and microwave ambient, granular synthesis, and improvised experimental electronica. He continued making music as Motor, and under several new aliases, including F.S.B. and >ed.s, leaving it to other pioneers of minimal techno in Russia (Anton Kubikov and SCSI-9, Yura Moorush, Lazyfish, and more) to fulfill a steady demand for cutting edge post-Soviet productions on the European club scene. Five years later, Motor produced another predominantly techno album, Mammoth, which marked his brief comeback on the local minimal/deep techno Moscow stage.